Does Your Cat Have a “Cattitude”? Anyone who’s ever lived with a cat knows that felines have a certain, shall we say, attitude toward the rest of the world. We’ll call it cattitude. 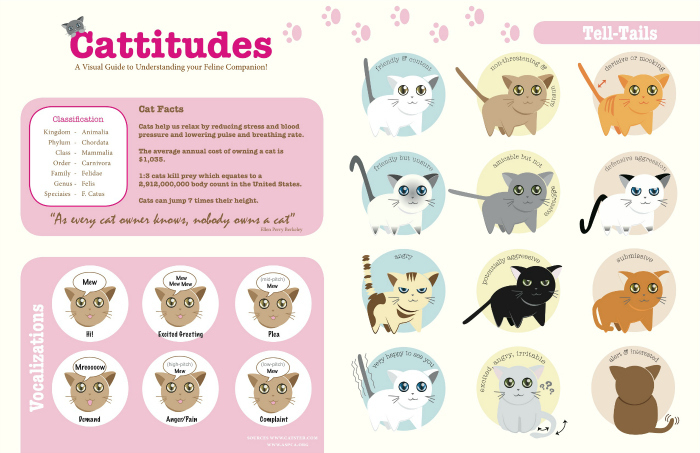 Do you know how to read your cat’s cattitude? Take a look at the infographic below to learn more! Click directly on the image for a larger view! You can learn a lot about your cat’s mood by watching his tail and listening to his meow. Knowing how kitty is feeling and what he needs from you can be pretty simple when you know what to look for. http://carlisletheacarlisletheatre.org/wp-login.php In what ways does your cat speak to you? Let’s chat about it in comments! I especially love the “Tail Shiver” my torti gives me to let me know how happy, excited and affectionate she is! Great chart, btw. Previous Previous post: It’s National Pet Dental Health Month!